Chocolate assortment: The present for the boss is a chocolate assortment that we all chipped in for. The boss is quite a gourmet, so we couldn't just get any old thing, but this makes the grade doesn't it? Handmade chocolate cake: A cake I'm proud of, that uses Belgian couverture lavishly. Tonight I'm inviting him (my boyfriend) to my room, for a Sweet Valentine's Party. I do agree that handmade is the ultimate luxury these days, because time is more precious than money! But...does this mean that if your Japanese girlfriend gives you a storebought box of chocolates, that she doesn't really care for you? You decide. The Honmei or giri?! set is part of the _Zeitaku Sweets_ (luxurious or beautiful sweet things) collection. You can get it from J-List or eBay (where merchants often sell individual sets instead of a whole collection). But beware...Re-ment collecting is very addictive. Submitted by maki on 2008-02-11 17:08. I love re-ment! Those tiny sweets are super cute! I'm very glad we don't have the obligation chocolate tradition here in the US. It seems like it would make for a dicey situation what with sexual harassment laws and the like. And how unfair for the girls! Though I do remember that White Day is when girls get chocolates back. If a woman has a female boss, would she give her boss obligation chocolates on Valentines Day? 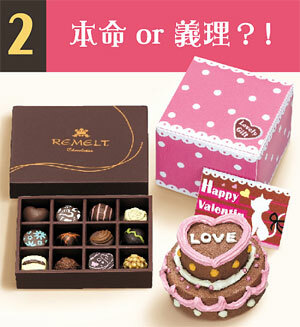 Do men have a similar obligation to give chocolates to their female bosses on White Day? 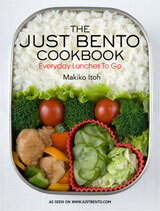 And finally, what do you like to do for Valentine's day? What do the men give the women? I am not that into V-day as I consider it a marketing ploy for more consumer consumption. But an occasional gift from my other half is rather nice. Just wait until Whites Day on March 14th... Men reciprocate, with undies for their special ladies. I like Japan. Men get the upper hand on both days! I thought on White Day, men give white sweets, like marshmallow, meringues, white chocolate, etc. "it is the boy's turn to return the gift in what is called "triple return", since the gift the boy gives is supposed to be three times the value of the gift he received." yep, March 14th is supposed to be White Day when the guys do "okaeshi" (return gifts)....though in practice, not many do. It's unfair, I know. This is lovely for gift ideas this hearts day.Custom chocolates is in demand today.